gases and liquids of various levels of complexity. We employ computational as well as analytical methods to solve applied and fundamental problems. We collaborate with experimental as well as theoretical researchers from a wide variety of fields, ranging from chemical engineering to mathematical physics. 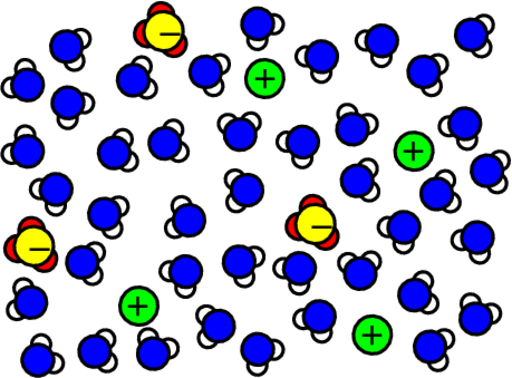 The materials we study the most at the moment are electrolytes and polymeres. More details on research activities below. Postdoc. Statistical mechanics and transport properties of complex fluids. PhD student, NTNU/SU. Simple models for friction of electrolyte systems. PhD student, NTNU/SINTEF. Atomistic molecular-dynamics simulations of friction and wear of polymers. Collaboration with Sergio Armada at SINTEF. PhD student, NTNU Department of Physics. Creep and fatigue in nanometric fibrous materials. Main supervisor Alex Hansen (NTNU Department of Physics). PhD student. Viscosity of complex polar fluids, electrolytes, and ionic liquids. PhD student. Modelling transport in materials. Master student. Cascading failures in dynamic networks. Together with Yiliu Liu. Exchange student. Cascading failures in dynamic networks. Together with Yiliu Liu and Baruch Barzel (Bar-Ilan University). Master student. Molecular-Dynamics simulations of salts at the oil/water interface. Master student. Modelling collective altruism in the fight against climate change. Master student. Simulating noise generation by friction. Together with Bjørn Haugen. Specialisation project student. Machine learning for cross-country ski friction. Specialisation project student. Modelling fretting fatigue. Together with Bjørn Haugen. A list of some available topics for Master-level projects. Tribology Laboratory at NTNU and SINTEF. PoreLab - Centre of Excellence (SFF). LifeX Gemini Centre: LIFEtime eXtension of metallic structures. The materials group lunch seminar schedule. The Gemini workshop on polymer surfaces and tribology - from foundations to applications, Trondheim, Norway, 26 - 27 November 2018. Molecular Mechanisms in Tribology, Beilstein Nanotechnology Symposium, Potsdam, Germany, 2 - 4 October 2018. Long Nordita Program: Current and Future Trends in Stochastic Thermodynamics at Nordita in Stockholm, Sweden, 4 - 29 September 2017. Faraday Discussion: Chemical Physics of Electroactive Materials in Cambridge, UK, 10 - 12 April 2017. COST action MP1303: Understanding and Controlling Nano and Mesoscale Friction. Many (in fact most) systems of practical interest are moving, i.e. out of equilibrium. Transport in materials such as diffusion and friction can lead to changes over time that produce wear, damage, degradation, and loss of function. Transport properties in general, but friction in particular, are challenging theoretically, because there is no general formalism to describe them. To understand transport, we must link microscopic dynamics of particles to macroscopic averages. For equilibrium systems, the powerful formalisms of equilibrium statistical mechanics provides a framework that can be used to link the microscopic to the macroscopic. For systems with transport, which are out of equilibrium, we are stuck using ad-hoc approaches that are only valid in particular cases, and often we are forced to resort to numerical simulations. Friction is so ubiquitous in everyday life that we often don't even think about it. In industrialid societies, a great deal of energy and material is lost due to friction, and friction and wear are extremely important in the operation of all devices with moving parts. Humans have been dealing with friction since prehistoric times, and we have developed phenomenological laws to describe it. Nevertheless, we still do not fully understand these laws and their coefficients. As a result, attempts to engineer low-friction surfaces or effective lubricants are often based on trial and error. One of the main reasons why friction is such a challenging subject, is because many different effects occur at different scales. While two sliding surfaces appear flat on macroscopic scales, they are in fact almost never truly flat (see figure). On smaller scales, the roughness of the surfaces means that the actual contact area is small compared to the apparent contact area. The actual contacts are of the order of micrometer in size. Energy is dissipated in a variety of ways at these contacts by atomic interaction that occur on the scale of a nanometer. To understand friction on large, macroscopic scales, we must first understand friction on micro and nanometer scales. (The study of friction on very small scales is called nanotribology.) During the last few decades, there have been enormous developments in experimental techniques for probing friction on small scales, such as the atomic force microscope (AFM), but theoretical understanding is lagging behind. Theoretical techniques have also undergone developments: the mathematical understanding of dynamical systems as well as the massive increases in computing power have handed us the tools we need to finally understand friction. In our group, we study and model friction on this basic level. We employ detailed atomistic simulations as well, but our main focus here is on fundamental (qualitative, general) understanding and relatively simple models that contain the essential dynamics. We are for example interested in the behaviour of solid lubricants, molecules adsorbed on sliding surfaces, and structure of polymers. Nanoscale systems are becoming more and more experimentally accessible, due to advances in microscopic manipulation and measurement techniques. Nano-scale friction experiments, using Atomic Force Microscopes for example, provide an especially useful window into transport of mass, energy, and momentum in nanoscale systems. Conceptually, these systems are challenging, because fluctuations are large, which means the systems are by definition out of equilibrium, and surface effects can dominate over bulk effects. Theoretical approaches are there often limited to numerical simulations. Stochastic thermodynamics and dynamical systems theory are the most promising basis for understanding the mechanics of nanosystems. Besides nano-scale friction, we also study other mechanical properties related to the nanoscale structure of materials. Accurate values for transport coefficients such as the viscosity of complex gases and liquids are needed in many practical applications. The viscosity of a liquids, for example, is the key to lubrication. Real liquids are challenging, because of complicated interactions (such as in the case of electrolytes) and rich variety of geometries of the molecules. This often makes numerical simulations difficult and inefficient. There is only one usable analytical theoretical approach for turning detailed knowledge of the interactions between molecules into transport coefficients of fluids such as the shear viscosity: kinetic theory of gases and liquids. Nevertheless, it is notoriously difficult to obtain accurate results for transport coefficients of any but the simplest systems. Our objective is to develop new kinetic approaches to transport coefficients such as viscosity and diffusion of liquids and gases. We sometimes stray into other fields, such as high-dimensional chaos, strongly-correlated electron systems, glasses, networks, biophysics, data mining, and social science.